This Toppik 3 Piece bundle from hair loss ireland gives you everything you could possibly need to be able to get the most from your Toppik Hair Fibres. 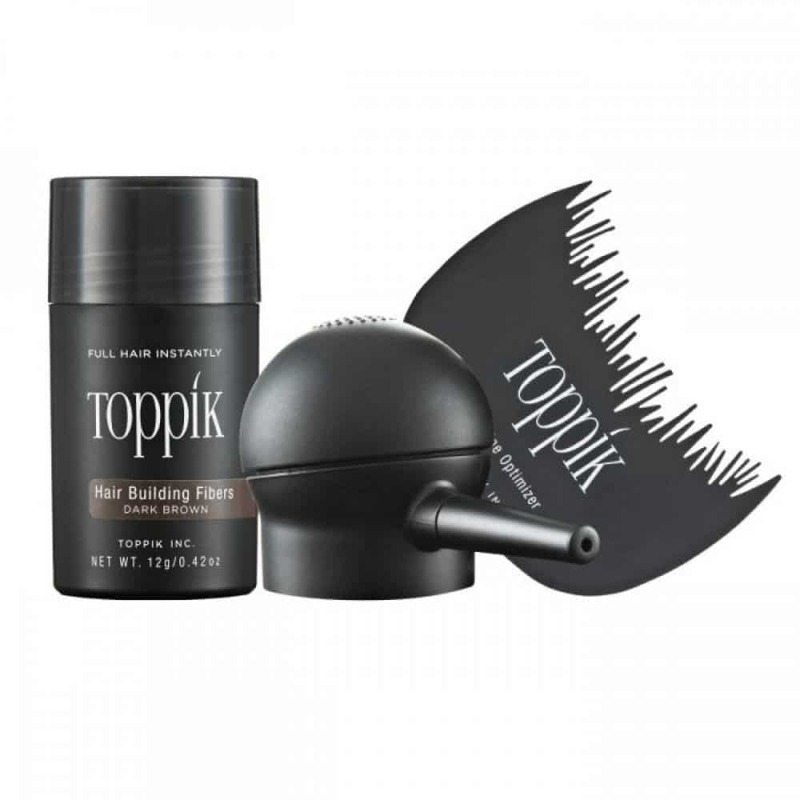 The bundle includes the Toppik Hairline Optimizer, Toppik Spray Applicator and the Toppik Hair Fibres as one handy kit. Toppik Hair Building Fibers are the instant solution to thinning or balding hair for both men and women. Toppik Hair Building Fibers is not a spray, cream or cover-up and is made of the same proteins (Keratin) as your own hair. Toppik Hair Building Fibers naturally intertwines with your own hair to make it look thick and full in less than 30 seconds. Simply shake the Toppik Hair Building Fibers over your thinning areas and you’ll be amazed how well Toppik transforms any thin or even colourless “”vellus”” hairs to suddenly look thick and full again. Toppik Hair Building Fibers are also undetectable and don’t run, smear or stain. It is proven to withstand wind, rain, and even perspiration due to the strong cling of the fibres to your own hair. It will stay in place until you next shampoo your hair. Please note that Toppik Hair Building Fibers cover thinning or very thin patches of hair. Toppik Hair Building Fibers are not suitable for completely hair free or bald areas. 2. Shake or spray (with Toppik Spray Applicator) hair fibres into thinning areas. 3. If applying hair fibres near the hairline, use Toppik Hairline Optimizer to achieve a natural-looking front hairline. 4. Gently pat hair to disperse hair fibres. 5. If desired, lightly comb, brush, or style your hair after applying hair fibres. Toppik’s Spray Applicator is your go-to tool when you need a more precise, targeted application of hair fibres. If you’re trying to use hair fibres on a hard to reach place, like the crown or near the hairline, the Spray Applicator allows you to spray the hair fibres exactly and only where you need them. It’s usually ideal for smaller areas of thin or thinning hair, since you can target the hair fibres into a specific area. It also works well to disguise parts, cover up root regrowth, or blend hair extensions. The Spray Applicator is easy to attach, but just keep in mind that it only works with the Regular size (12g) and Large size (27.5g) Hair Fibers bottles. To attach the Spray Applicator, simply remove the sifter cap from the Hair Fibers bottle and screw on the Spray Applicator. 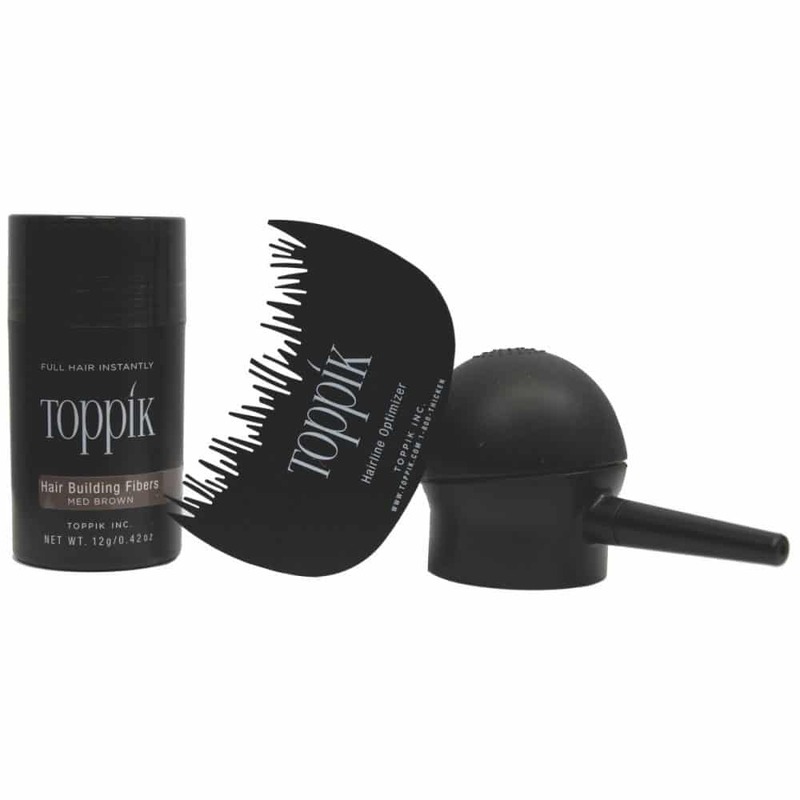 The Toppik Spray Applicator significantly improves the great result you get when using Toppik Hair Building Fibers. The applicator sprays the hair fibers onto your hair which gives an even, more natural look as the fibers can be targeted to specific areas. Because of this precision it makes the spray applicator an economical purchase – quite simply, you use less Toppik Hair Fibers! For best results use this with Toppik Hairline Optimiser, a laser generated template that perfectly mimics your natural hairline. Toppik Hair Building Fibers resist wind, rain, and perspiration for long-lasting results in all conditions. They are available in nine shades that can be mixed to match any hair colour. Hair Building Fibers work for all hair types and textures. Also great for part lines, covering extension tracks and touching up roots between hair colour appointments. Easily washes out with shampoo.